An alloy component or assembly is only as strong as its welds. The use of the appropriate filler material to create a weld between two alloy parts is key to ensuring the reliability and integrity of the component in question. The only way to ensure that a welded joint will hold up under the expected conditions for the expected length of time is to be completely sure that the weld material used meets specifications. Weld material specifications are based on not only the expected performance of the weld itself, but also on the properties of the base alloys that are being welded together. Deviations from the specified weld material can happen for a variety of reasons, including materials mix-ups in-house, or receiving the wrong material from a supplier. Weld materials mix-ups are time-consuming and costly to correct. They can cause whole lots of product to have to be remade. In some industries, mix-ups in weld materials are more than an annoyance or financially costly event. In the oil refining, chemical manufacturing, and aerospace industries, for example, an alloy materials mix-up—including weld materials—can lead to equipment having to come offline for significant amounts of time, injury, or even death. Avoiding weld materials mix-ups is important across all industries, whether to avoid loss of profit or loss of life. Engineers, installers, quality control engineers, and others in industries that use welded alloy parts require tools that quickly and easily verify weld materials in all parts of the process from the time the material is received from a supplier to in-process weld spot-checking. Handheld x-ray fluorescence (XRF) is the ideal tool for the job. A modern handheld XRF device provides full alloy chemistry and alloy grade identification within a matter of seconds, and can be used anywhere from the warehouse floor, to checking in-process welds, to final product testing. Verifying the alloy composition of weld materials is absolutely essential for the viability of many businesses; in businesses where a small difference in alloy grade can be the difference between life and death, the requirement for alloy grade verification is 100%. This is commonly referred to 100% PMI (positive materials verification). User-friendly interface eliminates frustration and allows even the most novice user to quickly master the instrument. 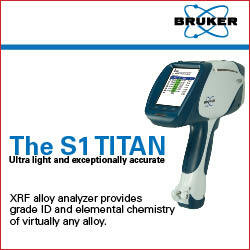 Contact us today for more information and a free demonstration of the BRUKER S1 TITAN handheld XRF alloy tester for weld material analysis.